Over the past few years, it's become easier than ever to stream live videos online, from celebrity updates to special events. But it's not always easy for people to determine which videos are live and know when to tune in. If your website streams live videos, use the livestream developer documentation to flag your video as a live broadcast and mark the start and end times. In addition, VideoObject structured data is required to tell Google that there's a video on your page. 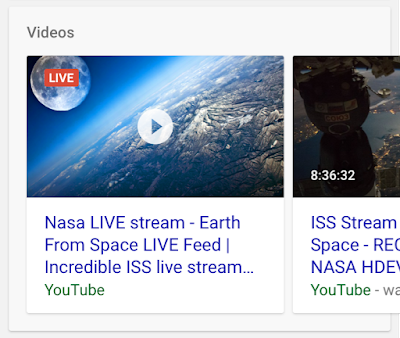 The Indexing API now supports pages with livestream structured data. We encourage you to call the Indexing API to request that your site is crawled in time for the livestream. We recommend calling the Indexing API when your livestream begins and ends, and if the structured data changes. For more information, visit our developer documentation. If you have any questions, ask us in the Webmaster Help Forum. We look forward to seeing your live videos on Google! This entry was posted in Google Webmaster Central Blog and tagged API, crawling and indexing, rich results, search results, Structured Data, Video on December 5, 2018 by Google Webmaster Central.